58"W, 28"D, 34-1/2" Extra-High Work Area and 2 Doors for BIG items! You'll really appreciate the extra width and height! Our Model 976 has a huge 58" wide, 28" deep, 34-1/2" high work area. Wheels, axles, heads, manifolds, fuel pumps, carburetors, castings, mirrors, fenders, bumpers, rims with mounted tires, motorcycle frames, and cross supports will easily fit inside! 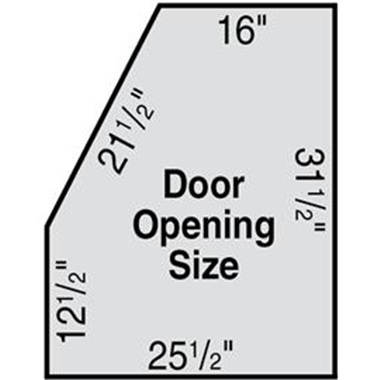 Two doors with angle-iron framework make loading parts easy. 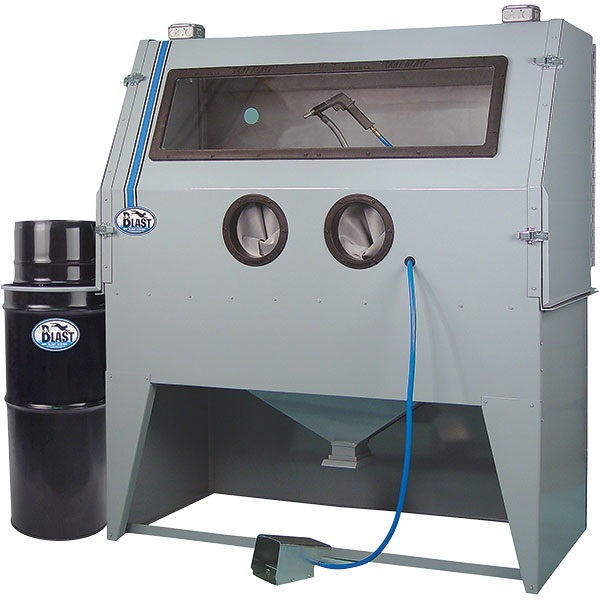 C-35 Foot-Pedal Power Gun and built-in recycling system with no skip, no surge operation make blasting parts a breeze. 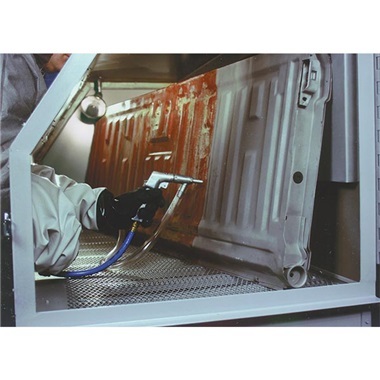 Easy to use: simply load parts through either side door, aim power gun, push foot pedal, and start removing rust, paint and scale in seconds. SPECS: Overall size - 62"w, 30"d, 71"h. Work area - 58"w, 28"d, 34-1/2"h. Two full-size 11 gauge steel side-loading doors with welded angle-iron framework. 18 ga steel body. Requires 10-15 cfm @ 80 psi. 125 psi max. 5 ft vac hose & Vac-50 HEPA Vacuum System. Fully Assembled. Crate size: 68"w, 34"d, 76"h. Ship wt: 480 lbs. IN STOCK - Ships Quick - within 24-48 hours! Made in USA! Ship wt 480 lbs motor freight. Unload or Liftgate Service is available for this equipment (extra cost, in addition to freight adder). Click on Unload or Liftgate Service in suggestions below for details. For commercial or shop use, or if you plan on using your Model 976 or larger cabinet more than an hour a day, we recommend our 180-DC Dust Collector. Call for additional cost and to order. Very nice quality throughout and great company to work with. Service & Delivery comments: Service was prompt with nothing damaged. Everything was well packaged. Works Great But Needs A Lift. The cabinet works great and does everything it's supposed to do, but It is way too short. I had to make a 6" riser for mine to get it up to a height that's comfortable for me. At 6 ft. tall, I'm fairly average in height. But in the as shipped configuration, I had to crouch down just to get my arms in the gloves. The only way I could use the cabinet was to was to crouch or set on a stool. Once I installed the riser, it was perfect. Great light! Lights up the cabinet very well. The installation of the light was easy. And with it added to the 2 flood lights my Skat Blast 970 is lighted up much brighter. Visibility was increased significantly. i really did need this lamp great help! I already have tow of your cabinet flood lights with LED's I put this one just right above the gloves and it REALLY did do the trick, awesome!!! I built a custom blast cabinet that I put this light in the top. It works great as it should and is super bright. Have been blasting for a month so far and have had no issues. Service & Delivery comments: Delivery was quick, no damaged products. Service & Delivery comments: delivery was prompt and curtious.